Hamas obtains funding from foreign sources that support the full range of its activities, including terrorist attacks; social services; and radicalization and recruitment. Since its inception, Hamas has cultivated a complex fundraising network, through which it receives funds from U.S.-designated State Sponsors of Terrorism, such as Iran; a network of mainly Saudi and other Gulf State individuals and charities; legitimate, illegitimate, and phantom businesses; and an international network of Muslim Brotherhood organizations. Most of the money – tens of millions of dollars raised every year on Hamas’s behalf prior to 2006 – originated outside the Palestinian Territories. According to the U.S. government, the Union of Good is an umbrella “charitable” organization that constitutes a principal fundraising mechanism for Hamas. Established in 2000 almost immediately after the outbreak of the Second Intifada, the Union of Good was conceived of by Sheikh Yousef al-Qaradawi, an Egyptian-born Muslim Brotherhood leader who publicly sanctioned suicide bombings against Israeli citizens through a series of “fatwas” he issued in 2001. Sheikh Qaradawi is the Union of Good’s current leader and chairman. The Union of Good was declared an “unlawful organization” in 2002 by the Israeli government because of its ties to Hamas. The leadership of Hamas created the Union of Good in late-2000, shortly after the start of the second Intifada, in order to facilitate the transfer of funds to Hamas. The Union of Good acts as a broker for Hamas by facilitating financial transfers between a web of charitable organizations--including several organizations previously designated under E.O. 13224 for providing support to Hamas--and Hamas-controlled organizations in the West Bank and Gaza…. The Union of Good's executive leadership and board of directors includes Hamas leaders, Specially Designated Global Terrorists (SDGTs), and other terrorist supporters. The Islamic Center of Gaza or the Islamic Complex-Gaza, otherwise known as al-Mujama al-Islami, is one of the oldest and most important charities comprising Hamas’s da’wa network. Formally established in 1973, al-Mujama focused in the 1970s on building new mosques to establish a power base for the Muslim Brotherhood outside the traditional channels of the Islamic religious authorities in the Gaza Strip. Sheikh Yassin, a founder of Hamas and its spiritual leader until his death, founded al-Mujama, which he originally developed as an umbrella organization for several religious charities and groups in Gaza. 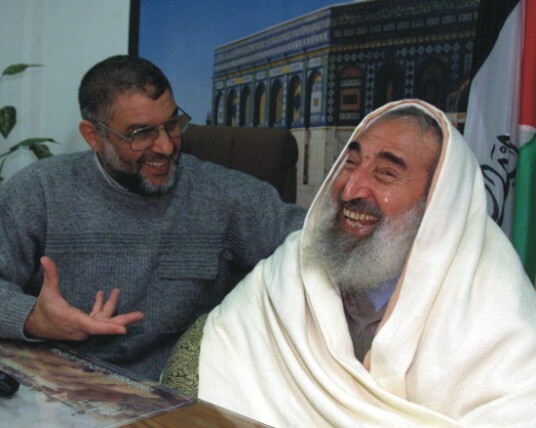 Yassin’s deputy, Abd al-Aziz al-Rantisi, was also a co-founder of both al-Mujama and Hamas, and both of them have been featured in the organization’s fundraising literature. In the late 1970s and early 1980s, al-Mujama turned its attention to a Muslim Brotherhood take-over of the Islamic University of Gaza, which further extended its influence in Gaza. In 1993, Hamas operative Muin Shabib, speaking at a Hamas meeting in Philadelphia, tied al-Mujama to Hamas and described it – along with others – as “our organizations.” Due to al-Mujama’s ties to Hamas, it was declared an “unlawful organization” in 2002 by the Israeli government, and its accounts were frozen by the Palestinian Authority in 2003.
the work of the Islamic Society and the rest of Hamas’s network in the decades up to, during and after the second intifada, when families needed it most, represented not so much a donation as an investment by Hamas, one that reached a lucrative political dividend in the 2006 election. According to public records, al-Jam’iya’s branch offices maintained accounts at Arab Bank. According to public records, al Salah maintained one or more accounts at Arab Bank. During the relevant time period (2000-2004), the Islamic Charitable Society – Hebron (“ICSH”) was part of Hamas’s da’wa network. A 2001 FBI report details substantial connections between the ICSH and Hamas; both current and former ICSH leaders have been identified as Hamas operatives or individuals who have worked with Hamas. For example, Khalid Mishal, the head of Hamas’s political bureau, identified Abd al-Khalek al-Natshe as part of a generation of Hamas founding members in Hebron. Due to the ICSH’s ties to Hamas, it was declared an “unlawful organization” in 2002 by the Israeli government. In a letter dated November 28, 2002, the German Intelligence Service (BND) informed the German Ministry of the Interior in Berlin, “the association Al-Jam’iya al-Khairiya al-Islamiya / Islamic Charitable Society (Hebron) is an Islamic charitable association directly linked to HAMAS.” Israeli military raids of ICSH offices have uncovered Hamas pamphlets and posters of Hamas suicide bombers. The Union of Good runs its activities in the southern West Bank through the ICSH. The ICSH received much of its funding from foreign charitable institutions, such as HLF, which contributed over $1,600,000 between May 1991 and November 2001, before its funding was frozen by the U.S. government. According to public records, the ICSH maintained one or more accounts at Arab Bank. During the relevant time period (2000-2004), the Tulkarem Zakat Committee was part of Hamas’s da’wa network. A 2001 FBI report identified the Tulkarem Zakat Committee as being controlled by Hamas. Many of the leading members of the Tulkarem Zakat Committee were senior Hamas members in Tulkarem. Due to the Tulkarem Zakat Committee’s ties to Hamas, it was declared an “unlawful organization” in 2002 by the Israeli government. In a letter dated November 28, 2002, the German Intelligence Service (BND) informed the German Ministry of the Interior in Berlin, “The Zakat-Committee of Tulkarm is clearly under the control of HAMAS.” Additionally, HLF (designated in 2001 by the Department of Treasury as a terrorist organization and convicted in 2008 of providing material support to Hamas) donated over $315,000 to the Tulkarem Zakat Committee between May 1991 and October 2001). According to public records, the Tulkarem Zakat Committee maintained one or more accounts at Arab Bank: Account 1; Account 2; Account 3. During the relevant time period (2000-2004), the Nablus Zakat Committee was part of Hamas’s da’wa network. The Nablus Zakat Committee is one of several “Hamas controlled organizations.” The U.S. government identified many of the leading members of the Nablus Zakat Committee as senior Hamas leaders in Nablus. In 1993, Hamas operative Muin Shabib, speaking at a Hamas meeting in Philadelphia, tied the Nablus Zakat Committee to Hamas and described it – along with others – as “our organizations”. Dr. Abd al-Rahim Radi al-Hanbali, chairman of the Nablus Zakat Committee, is described by Israel as “a senior political Hamas activist.” Following a suicide bombing at a Tel Aviv café in March 1997, Sheik Hamid Bitawi, the deputy chairman of the Nablus Zakat Committee, told a crowd of 10,000 Hamas supporters “I have good news. There is a suicide bombing in Tel Aviv.” He continued, “This is the only language the occupiers understand, the language of martyrdom.” Bitawi issued a religious edict (fatwa) praising suicide attacks as “actions [that] are an exalted expression of jihad for the sake of Allah and are not to be considered suicide.” Due to the Nablus Zakat Committee’s ties to Hamas, it was declared an “unlawful organization” in 2006 by the Israeli government. The Nablus Zakat Committee received over $457,000 from the Holy Land Foundation between May 1991 and October 2001. According to public records, the Nablus Zakat Committee maintained one or more accounts at Arab Bank: Account 1; Account 2. According to public records, al-Tadhamun maintained one or more accounts at Arab Bank. According to other public records, the Ramallah–al-Bireh Zakat Committee maintained one or more accounts at Arab Bank. During the relevant time period (2000-2004), the Jenin Zakat Committee, also known as the Jenin Charity Committee, was a central part of Hamas’s civilian infrastructure in the Jenin area that disbursed a substantial portion of its charity money to the families of suicide bombers. The U.S. government identified many of the leading members of the Jenin Zakat Committee as senior Hamas leaders in Nablus. Due to the Jenin Zakat Committee’s ties to Hamas, it was declared an “unlawful organization” in 2002 by the Israeli government. Ahmed Salatneh, one-time head of the Jenin Zakat Committee, has been heavily involved with Hamas for a number of years; he was involved in transferring bomb-making materials for the preparations of explosives in 1992 and participated in a car bombing in 1993. Other leading members of the Jenin Zakat Committee were members of Hamas, including Muhammad Radwan, who stated that in 1991 or 1992, Salatneh, with whom he worked in the Jenin Zakat Committee, approached him and offered to recruit him into Hamas; Nasser Khaled Ibrahim Jarrar, identified as an operative of the al-Qassam Brigades on its website and identified by Khalid Mishal, the head of Hamas’s political bureau, as a martyred Hamas operative; Ibrahim Hassan Ali Jaber, placed under administrative arrest four times by Israel for being a senior Hamas member who led riots in the First Intifada and while under arrest admitted to having been Hamas’s leader in the Jenin refugee camp, where he recruited activists and distributed leaflets; and Zayd Mahmud al-Rahim Salameh Zakarneh, a Hamas activist who has served as the director of the Jenin branch of the PA Ministry of Muslim Endowments (Waqf) and was the chairman of the Jenin Zakat Committee in the early 1990s; (see also English translation of Zakarneh Indictment). The Jenin Zakat Committee also funds and supports the families of suicide bombers and has been linked to HLF, which provided it with over $655,000 between May 1991 and December 2001. According to public records, the Jenin Zakat Committee maintained one or more accounts at Arab Bank. During the relevant time period (2000-2004), the Al-Islah Charitable Society was a multi-branch charitable organization controlled by Hamas. Its Ramallah branch was founded by Hamas military commander Jamal Tawil, who acknowledged founding the Al-Islah charity as a purportedly legitimate entity through whose accounts he could launder the monthly fund transfers he received from Hamas. According to the Israeli government, the Al-Islah Charitable Association distributes money to the families of suicide bombers and prisoners in Palestinian and Israeli jails. Tawil served as head of a Hamas prisoners committee responsible for supporting the families of Hamas prisoners and providing petty cash to the prisoners themselves. He was convicted as a result of his activities on Hamas’s behalf. In the winter of 2001/2002, the association was banned by the Palestinian Authority because of accusations that it belongs to HAMAS. Due to the Al-Islah Charitable Association’s ties to Hamas, was declared an “unlawful organization” in 2002 by the Israeli government. In a letter dated November 28, 2002, the German Intelligence Service (BND) informed the German Ministry of the Interior in Berlin, “The association Jam’iyat al-Islah / Al-Islah Charitable Society is directly associated with the HAMAS network. [The] President of the association, until he was arrested by Israel, was Jamal AL-TAWIL, known as a leading HAMAS member. According to public records, the Al-Islah Charitable Society maintained one or more accounts at Arab Bank.